Interviewer 1: Did any of your counties have to do the full recount? Michael Barbian: Not that I am aware of. This was originally distributed via Truthout. I've copied the videos to my own server, generated and MP3 from them, and transcribed the interview myself (see "more" below). Interview with Michael Barbain, Triad Systems Technician. Words I can't make out denoted with (can't make out) or (?). Periods denote pauses only. Interviewer 1: Could you ID yourself? I didn't get your ID earlier. Michael Barbian: My name's Michael Barbian, and I'm the reason we're all here today. I work for Triad Governmental Systems. Interviewer 1: When you were telling them about the under and over votes, it seems to me, now that I've heard what you've said, that you were just trying to help them so that they wouldn't have to do a full recount of the counties. Michael Barbian: As much information as possible is what I was trying to provide them with. And that's all it amounts to. It's for elections people to do the best job that they can, and they do a very thorough job. The more information you give someone, the better job they can do. Interviewer 1: And the information, it sounded to me, unless I've got the wrong piece there. It sounds like the under and over votes per precinct should be information that they had anyway on their computer. Michael Barbian: It was there. Interviewer 1: It was on their computer. And then there was that one copy there that was taken back for backup. Michael Barbian: It's normally not run off. In the last Presidential Election it became an issue in Florida and in this election. It just provides more information. It doesn't affect the outcome of the race, but it's information some counties like to have. Interviewer 1: So you work quickly with the Board of Elections, trying to help them I mean. You guys are trying to work on this election together. Michael Barbian: Year round support of elections. Michael Barbian: Same job it always is. Interviewer 1: Have you done a recount before? Michael Barbian: It's just a normal day at the office. Interviewer 1: How many counties did you go through personally? Michael Barbian: Probably six. For the recount you mean? Interviewer 1: And which counties. Do you know? 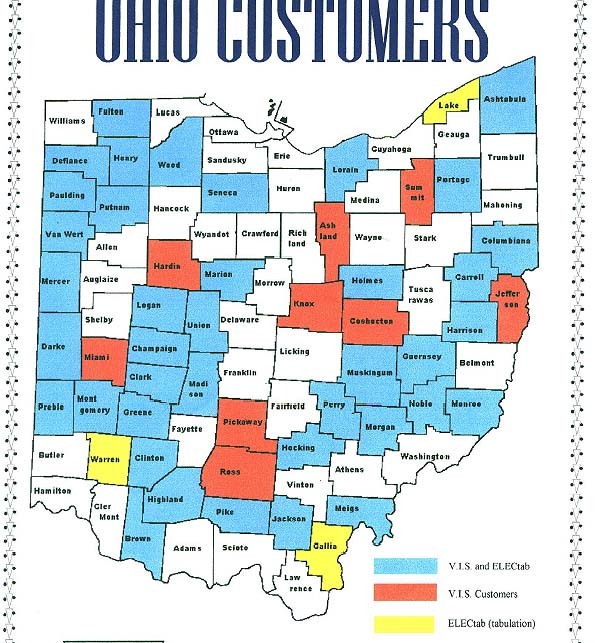 Note: Here's a map of the Ohio counties Triad Services. Interviewer 1: We certainly know more about Ohio counties than we did before, don't we? Michael Barbian: We always knew. The Board of Elections did a good job. Interviewer 1: Were you able to help them out at all? Try to help out the other counties -- give them as much information as you could? Michael Barbian: To answer every question and try to help the witnesses with answering questions for them and educating them on the whole overall process. Interviewer 1: Thank you very much. (to another person) Do you have any questions? Interviewer 2: How long have you been working at Triad? Michael Barbian: A little over 8 years now. Interviewer 2: Did Triad do a background check on you when they hired you? Michael Barbian: I don't know. Interviewer 2: Okay. How many technicians work for Triad? Michael Barbian: There are, let's see, we have five. Interviewer 2: And are you involved in any kind of programming? Or just maintenance? Michael Barbian: I'm on the technical support side. I don't know how to program. I do tech support for voter registration and ballot counting. Interviewer 2: And how long to you have to be working there, and how much training do you have to go through before you can start doing what you do now? Michael Barbian: We work closely. When we bring on a new employee, we don't really turn them loose for about a year or a year and a half...because there are so many things that you have to watch closely. Anytime a new employee comes on, they are watched closely and double checked. All of our work is double checked by Boards of Elections. So they test very thoroughly (can't make it out)...bring anything from our office. Michael Barbian: They're paid like a regular employee. We put them to work. Normally, once they've watched the process a couple times, then we put them more involved (skip in tape) in overseeing every step of the process. Back to Interviewer 1: You seem like a senior guy. Have you trained anybody? Have you had anybody tail you? Interviewer 1: Who was that? Michael Barbian: I worked with one of our current technicians, Brandon, and Jose, one of our other technicians. So they..everyone goes through training. I go through training (can't make it out) something pops up. It's a learning process. Everytime (?) changes or the Board of Elections asks for something new. So every day we always learn something new, and try to help out. Interviewer 1: Great. Can you give me Brandon and Jose's last names? Interviewer 2: How many technicans total did you say you have right now? Interviewer 2: And you've been with them for how long? Michael Barbian: Over 8 years. It was eight years I think last week or the week before actually. Interviewer 2: How long had Triad been in the election business when you joined the company? Michael Barbian: I'd have to do the math. Interviewer 2: They started in 1985? Interviewer 2: What I mean is that, the software that you guys use was actually purchased in full from a previously existing company? Michael Barbian: Oh. Not our tabulation. It was from (?) our company wrote it and it's our program. We did not purchase it. Interviewer 2: So your tabulation program, you guys programmed in-house? Interviewer 2: And when was that program written? Michael Barbian: Early 80's. That's when it first got started. Michael Barbian: As far as some of the dates, and when some of the different revisions...I don't know. Before I got there.